Babblings of a Mommy: My Interview With Jessica Alba, yes THAT Jessica Alba. My Interview With Jessica Alba, yes THAT Jessica Alba. 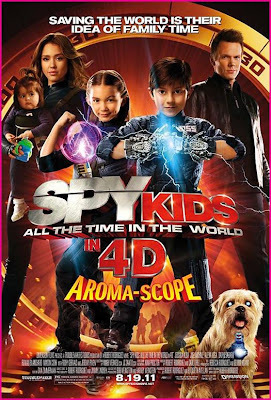 Recently Jessica Alba took the time to talk to a few bloggers including myself about her upcoming movie (Spy Kids: All the time in the world in 4D), family life, and personal style. I'm not gonna lie. I was extremely excited to get the opportunity to chat with her and was even more delighted to find out first hand how sweet and candid she is! She took her time to answer each and every question and even managed to get a few giggles out of us. In Spy Kids: All the time in the world in 4D Jessica plays a retired secret agent that is called back to duty when the evil Timekeeper played by Jeremy Piven threatens to take over the world. On the surface, Marissa Cortez Wilson (Jessica Alba) has it all...married to a famous spy hunting television reporter, a new baby and intelligent twin step kids. But in reality, trying to mother Rebecca (Rowan Blanchard) and Cecil (Mason Cook), who clearly don’t want her around, is her toughest challenge yet. Also, her husband, Wilbur (Joel McHale), wouldn’t know a spy if he lived with one which is exactly the case - Marissa’s a retired secret agent. Here's what the lovely Jessica Alba had to say. (Laughs) Well, we really didn't know that it was going to be 4D when we were shooting it, so that sorta came after the fact. I think it's a great/fun element to add to the film for kids. It's a kids movie and we all know that kids are used to interacting with their entertainment, especially with their iPhones or iPads and stuff like that, and so this is for that next generation kids that are used to that interaction and they can participate in the film in a way that you never could before. So like 8 times during the film they have a number that pops up and they have a scratch and sniff card and the kids can scratch and smell what we're smelling in the movie to feel more a part of the experience. I liked the scenes when I was going into labor because in the film I play a spy and I'm hiding it from my husband who's an interior decorator, so I'm in my last mission and I go into labor and I think that was a lot of the fun because I got to do a little bit of action, which I haven't done since Dark Angel and I miss doing action, but then again there was a lot of comedy because I obviously was supposed to be having contractions during the sequence--so that was funny and fun to play. I don't work as much as I used to so that's definitely helped for me as far as prioritizing my time and on the weekends my husband and I made an agreement that when we're with our daughter--it's pure family time. No blackberries, no emails, no texting. Just trying to give her as much attention as humanly possible. Well my mother and my grandmother were my examples growing up and they always made us kids feel like we were priority and number one no matter if they were working or busy. You know my mom, especially in the beginning of my life-before I started acting, she would work sometimes 3 jobs, but always managed to make my brother and I feel like we were number one. You know, I think whether or not you have a job that you can stay at home or you have a job that you can't and you have to be away and have to travel a lot--you should take the time for your kids and remind them that they're a priority. Umm. We're pretty boring. (laughs) We don't go on adventures and save the world or anything. No, we like to swimming or go to the park. We'll do whatever my daughter wants to do, so we'll play dress-up, but usually swimming is a big deal--especially this summer. Well she's picky so that's always fun. She like's eating fruit, so I'll give her grapes or an apple which is a big deal because she's a big girl now--so she can have a whole apple, or she can have a pear, or a peach which is messy but it keeps her occupied for a little bit (laughs) but she likes that she can have a big girl fruit now. I feel like everything. My daughter is a real good eater. It depends on whether not she changes her mind like 40 different times before dinner. Umm, gosh--she likes chicken and rice and vegetables. She loves my husbands tacos. He makes some really good tacos. She's pretty good at eating anything. Yeah, there's definitely a stage where I can't really pick her up anymore. I mean, I will if she's obviously freaking out--I'll throw her on my hip, but I'll be suffering for the rest of the day if I do that and my sciatic is not prepared for hoisting a 3 year old on my hip with the belly (laughs) and then I start getting these contractions when I'm holding her, but then I feel bad because I want to hold her! So we do cuddle time when I'm sitting down. Well, thank you first of all. Obviously when I'm pregnant is one thing, but I'm pretty conservative. I've never been someone who let's everything kinda hang out. When I was younger I feel like I was even more conservative. I used to dress like a tomboy and after I had my daughter I'm definitely a little more daring with fashion. I never wore shorts or a skirt that went above my knee before I was 27--I don't know I just wasn't comfortable with it, and then when I had my daughter I was like--you know what, I have a kid, it's fine. (laughs) Life is short. I just try to live in the moment as humanly possible and when I find that when I'm not trying to live for tomorrow and I don't know what's to come and I'm really enjoying what's happening right now--I feel like that's always my best day and when I feel like I'm living the dream. The few times I get to pamper myself I'll get my nails done or something like that or get a facial and that feels really nice. Well I think as far as the transition goes, I started when I was 12, but I really didn't have the exposure and people really didn't know who I was until I was an adult and when I was on a TV show called Dark Angel, so that helped--being known as an adult versus a kid. And then if I would encourage my kids? Oh God. (laughs) You know after they're done with college, they can do whatever they want, I would support them. They have the luxury of getting an education and grow up differently than I did, and if they want to get into the arts that's only going to make them more dynamic as artists--the more life experiences they have to bring into the work, so whatever they want to do at the end of the day--I'm all for it, after they finish college. How awesome!! She sounds real down to earth. She really is! She's a sweetheart. What a great opportunity and I'm sure it was much fun for you. She seems very real!! Wow! This is amazing, Jenny! I am so happy for you! Congratulations on the interview! It was great and I do love Jessica Alba's style.